Here is an example of what can happen when a retaining wall and steps are not adequately built. This installation was about 15 years old when these photos were taken. Much of the wall was close to collapsing. Notice the running joints and the soil that had run out through the wall. One of the thin step treads was broken because the stonework beneath it had collapsed. This wall was only about 24" high. The consequences would be much more significant in the case of a wall of greater height. Personal/public safety may be at risk. Proactive remedial work is important in such cases; waiting until a collapse occurs could be nothing less than disastrous. 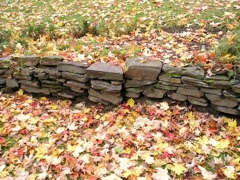 To avoid this scenario, be sure that any dry stone waller you hire has adequate training and preferably a minimum of DSWA-GB Intermediate certification; for larger retaining walls, an Advanced or Master Craftsman certificate is preferable. If you have any questions about the integrity of a dry stone structure, Thistle Stone Works can provide an inspection and/or detailed structural condition assessment. Please also visit the DSWA-GB (Dry Stone Walling Association of Great Britain) online at www.dswa.org.uk, where you can find freely downloadable pdf documents giving specifications for dry stone construction, as well as information on certification. In the Northeastern USA, training courses are run on a regular basis by DSWA certificate holders. Certification testing is available once or twice per year and details are posted on the DSWA website.